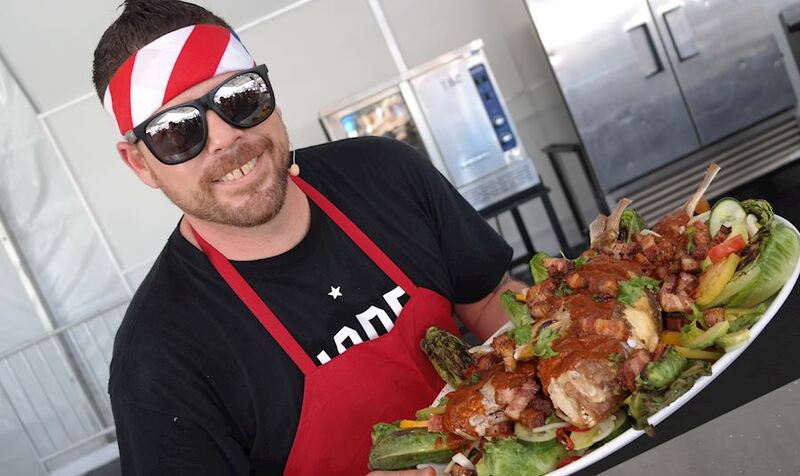 If you went to this years Kaaboo Del Mar, you may have seen Chef Ryan in action as he prepared a dish great for a So-Cal Sunday Dinner you definitely can make at home. Place bacon lardons on a small sheet pan and cook at 350 degrees until crispy on the outside. Remove to cool and reserve for plating. Heat oil in a wide rondo to 375 degrees. Put flour in a shallow pan and lightly press each snapper into the flour being careful not to press down to hard. Shake of residual flour and place directly into the hot oil. Cook for 5 minutes and turn over cooking for an additional 5-6 minutes. Remove to a pan lined with cloth napkin or paper towel. Heat grill to medium high heat, brush the baby romaine with EVOO and season with salt and pepper. Grill romaine for 2 minutes to get a char and remove to cool. On a medium sized platter place the romaine around the edges and then top with the tomatoes, onions, chiles, cucumbers and avocados. Drizzle with EVOO and citrus juices, season with salt and pepper. Place fish in the center of the platter and top with Guajillo Mole, bacon lardons and cilantro leaves. Serve immediately.